My “ode to unsweetened dairy-free yogurt” recipe post got a little out of control. 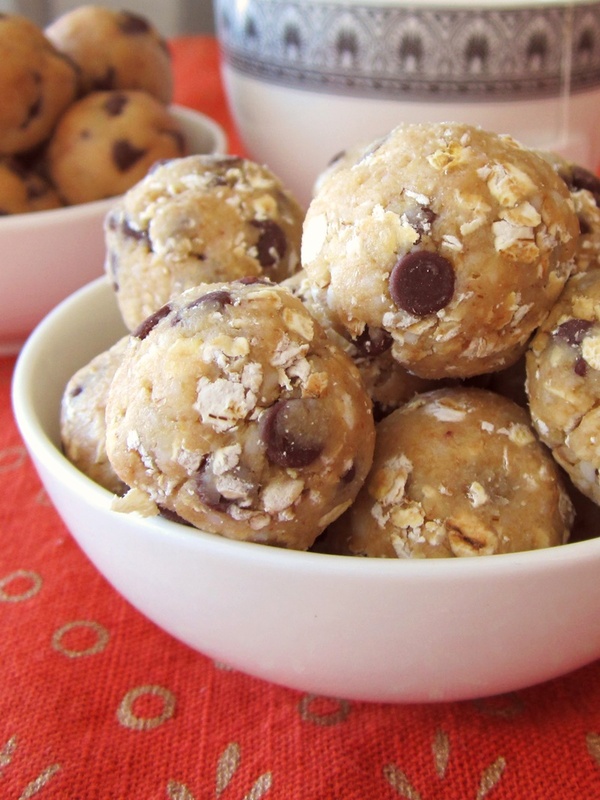 I had too many ideas, and started to veer off on tangents – these delicious oatmeal cookie dough balls being one of them. So rather than omit, I’ve given the recipe its very own home. My niece loved the original cookie dough balls, but I wanted a heartier, gluten-free version that Tony could enjoy, too. It required just a touch of adaption to get just the right texture. 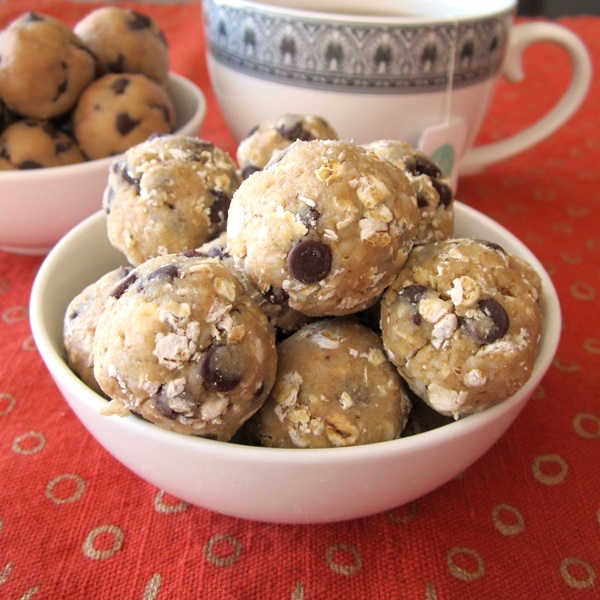 These oatmeal cookie dough balls are actually softer than the wheat version and have a milder flavor and earthy texture. My niece likes these, but prefers the wheat ones, while the oat version is definitely my favorite, and Tony certainly wasn’t complaining! 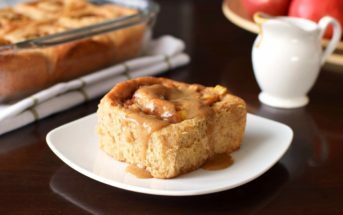 By ingredients, this recipe is dairy-free / non-dairy, egg-free, gluten-free (with certified gluten-free oats), nut-free, peanut-free, soy-free, vegan and vegetarian. Blend 1¼ cups of t he oats in a spice grinder or food processor until powdered into a flour. Whisk the oat flour, sugar, and salt together. Add the maple, oil, and vanilla, and stir until thoroughly combined. Add the yogurt, and stir until combined. Finally, stir in the remaining quick oats and as many chocolate chips as you like. Shape into balls (we use a ½ tablespoon for minis or 1 tablespoon for larger) and store in the refrigerator or freezer for enjoying at will. Where do I find the wheat version if the cookie dough balls? Would live to try these, but I cannot have oats. Thank you! 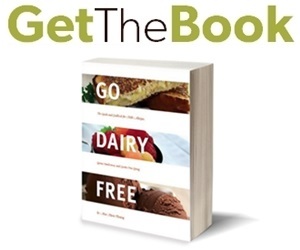 It is here -> http://www.godairyfree.org/news/5-low-sugar-dairy-free-recipes-yogurt – scroll down for that recipe. I do need to give that recipe its own home! I made these for a cookie exchange at work. They were a winner. I used the brown sugar. I thought that the brown sugar made them pretty sweet. My husband didn’t care. I may need to try the coconut sugar. We make these types of things all the time but never a chocolate chip one! I’ll definitely have to try this! 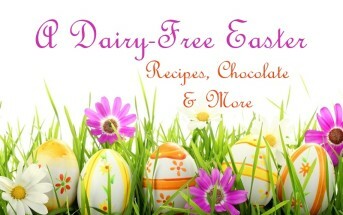 I love finding this recipe – already gluten-free and dairy-free! My friend brought over something like this recently after my baby was born and the big kids thought they were amazing. I can’t wait to make these for them. That’s great! I hope you and the kids enjoy them! Wow, this is incredible! I’ve been making healthier snacks for my daughter and I think this has to go on my “to-make” list. I love that it has so many good things in it. What a nice result of a tangent! I love to have these tasty little snacks on hand…even for breakfast! Energy balls without nut butter?! This mom with kids who have allergies is very very happy! Can’t wait to try! What a beautiful recipe so easy and so good must try soon! Wow these look great! I would really love one of these right now! Hi there!! 2 questions: can you sub honey for the maple syrup?? And can you use stevia in the raw instead of coconut sugar?? Thank you!! Hi Lisa, both subs should “work” but they will give off a different, sharper, probably sweeter taste. My version is a little more “caramel-like” and subdued. Assuming your taste buds are used to stevia on the raw (some find it off putting) it should be good! 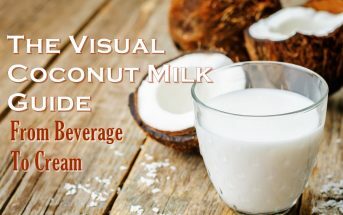 Hi, Where can I find coconut cooking oil?